I am obsessed with this look! I haven’t met a faux fur vest I haven’t liked! This look is so perfect for Fall! Such a cute and chic look!! I love it! Ugh, it has been warm here too! We have had a few cool days which I have taken full advantage of. I am loving fur vests for this season. The color of yours is beautiful! Thanks so much for stopping by my blog. I love yours! Love the vest! I like the longer length so that it covers the bum! Thanks for stopping by! This is such a perfect fur vest and it even has pockets?!! I really love the two tone colored boots, too! I have seen a lot of those this fall. Your fur vest is AMAZING!!! That vest is so cute. I love the color! This is a perfect look for fall. Love the faux fur vest. Such a cute vest and your boots are adorable! Great fall outfit! I LOVE this! I have been looking for a vest just like that for so long… 🙂 Thanks for your comment on my blog! LOVE that vest. It’s not me to like fur but I’ve been dying for a fur vest and you wore it exactly like my dreams haha. Oh my gosh! This is the cutest outfit!! I really think a white top, leggings and a fur vest is the greatest combo for fall/winter! You nailed it!! What a great vest! I love this fun, cozy look! That vest is fantastic! I can’t wait for it to cool off enough here to break out the faux fur! That vest is everything. It looks so rich and luxe. Love it! I think I need to make a visit to Zara! This fur vest is such a great color! I love, love, love it! Love the color of your vest! Matched your boots perfectly. That vest and those boots are perfection! I like big fur and I cannot lie! You little Fall cutie! And those Tory boots have me swooning! 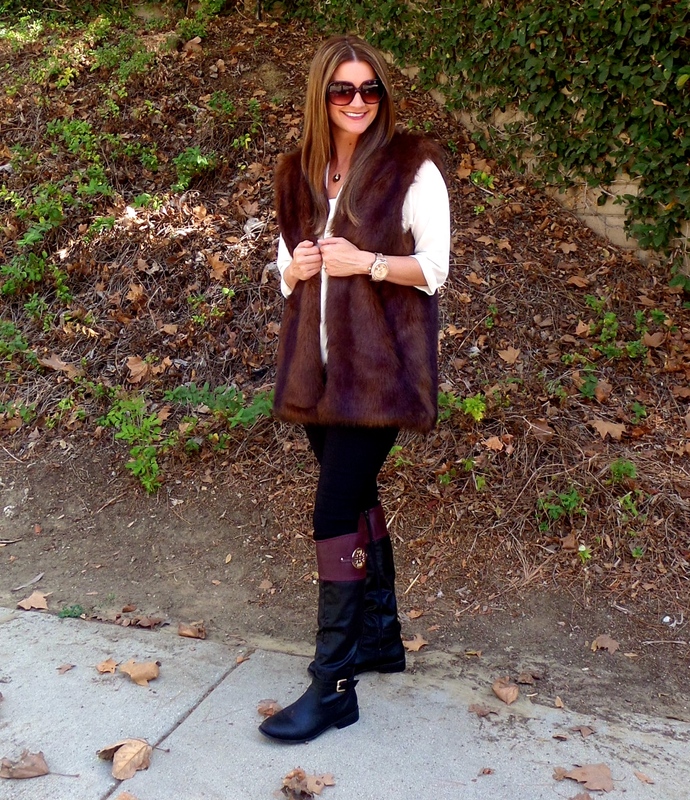 I’m loving faux fur and your vest with those boots are perfect! Great job!! Love the fur vest. Great look! I can’t wait to wear mine this fall/winter. Nice look, adore the boots! Hehe 70’s would be smoking hott here in Ohio right now–so jelly 🙂 I love this look–the fur is amazing! great look. love the vest! I love this look! Especially those boots! 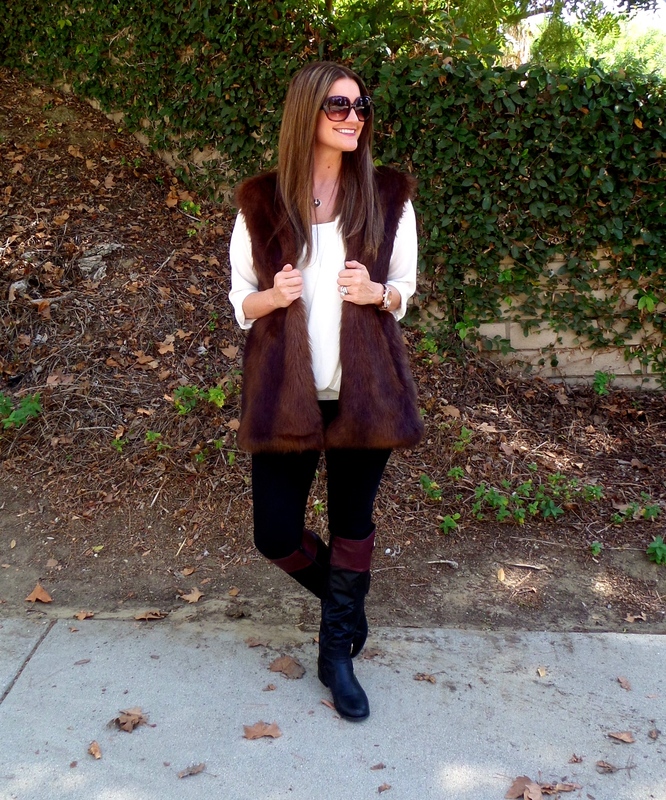 Such a great faux fur vest! That looks like the coziest, softest vest ever! Great pick! Would u like to follow each other n stay in touch ?? I don’t know what’s so unfortunate about having warmer weather– we are currently experiencing cold weather and short days and we would kill for warmer weather haha! 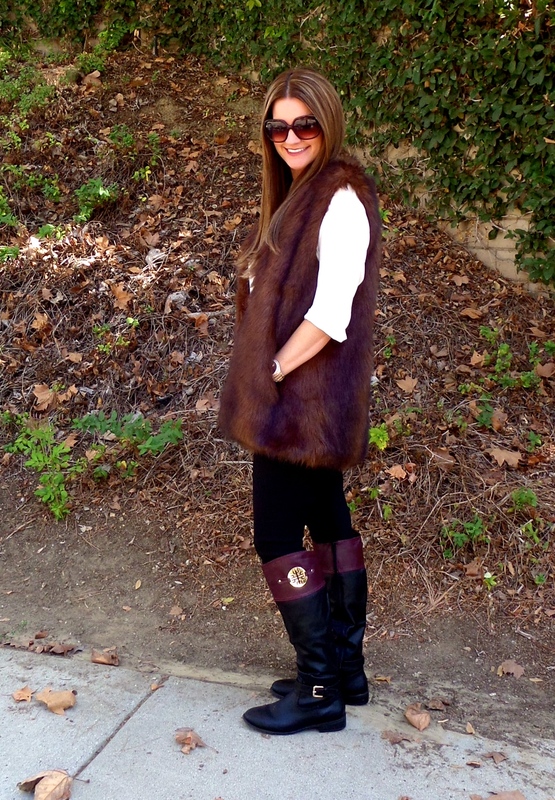 You look gorgeous in this fur vest, also adore the beautiful boots! I have not pulled out my faux fur vest yet… I think we are suppose to have cooler weather this weekend so maybe it’s time. Love how cozy this one looks! This outfit is just to cool. I love the faux fur with the boots. Really nice outfit Shauna! That fur vest is amazing! I need it right now! LOVE this fur vest! Zara’s fall collection has been amazing! I love everything about this look!! I just got my first faux fur vest and have been looking for ideas on how to style it! !